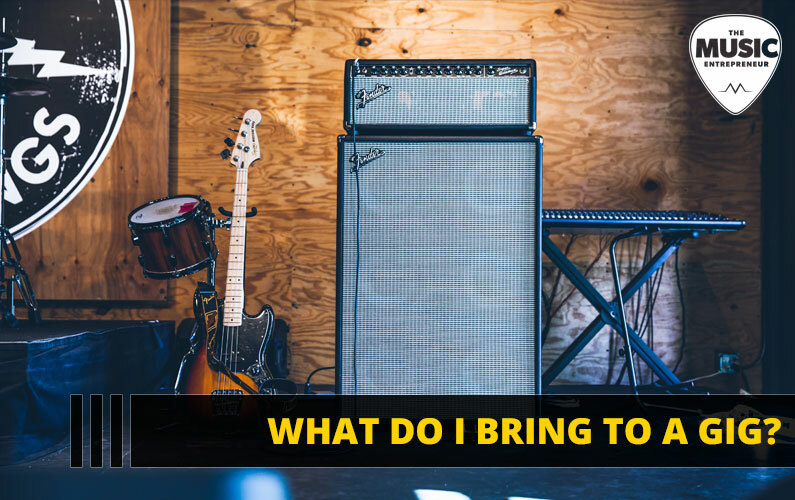 In this article, via T. Perry Bowers, you’ll learn what you need to bring to each and every gig you play. If you think you have something worth sharing with The Music Entrepreneur HQ community, check out our guest post guidelines. Now, without further delay, let’s learn what gear you need to bring to your gigs. Have you ever heard the expression “two is one, one is none”? It’s a military expression. Basically it means that if you have two of something, you’re almost guaranteed that one of them is going to work, if you only have one of something, you’re almost guaranteed it will fail. I usually have more than two guitar cables because I’m going in and out of my pedal board and into two amps. If I need four instrument cables, I have at least eight with me. I need speaker cables too because both of my amps have a head and cabinet. Speaker cables don’t take as much abuse as regular instrument cables, so they usually last longer and don’t fail as often. But I always throw in a few extra short cables in case one of my pedal patches fails. Usually the venues I play have their own PA systems, so I hardly ever need to bring microphone cables. If you’re going into scenarios where you’re bringing your own PA, you’re probably well on your way to being a sound professional. This blog is mostly for the working bands who play small to mid-size clubs. Speaking of cables, the power strip and extension cord combo are probably the most important items in your gig bag. You may have to draw power from the basement and bring it up to the stage in some venues so make sure you have a plethora of long extension cables. Throw three, four or five power strips in your bag. The minute you think a venue has plenty of power for musicians onstage, that’s the minute you’ll be wrong. If you have plenty of power options in your bag, the power on stage will be fine and you won’t even need it. It’s like a magic formula. Most likely much of the extra stuff will remain in your gig bag but if you don’t have it you’ll need it! I run two amps because most of my effects are in stereo. It’s handy in case one of the amps decides to crap out on me. It might be overkill to always bring two amps to a small venue local gig. But on tour, you’d bet I’d have a backup amp. Even if it were something small and mediocre sounding, I wouldn’t be caught without amplification in Bozeman, Montana! The next best thing to having an extra amp is to check with other bands playing the venue and see if they would be willing to share in an emergency. It’s good to know beforehand if the other bands are proprietary about their gear. You might want to ask yourself if you’d be willing to share too. You might be surprised what you’d say! Always bring two guitars to a gig. If you’re still that guy who only has one guitar, you, my friend, are an amateur. Strings break. Do you want to halt your show for five minutes while you re-string your guitar? That won’t give your audience the impression you are professional and worthy of bigger stages! Get yourself a backup guitar. Set it up, have it tuned and ready to go onstage. There’s no excuse not to. If a string breaks, get a buddy to restring your main guitar while you’re playing your backup. Don’t set it on the stand and pretend there is no chance you’ll break another string. Murphy’s Law right? You’re going to need a few sets of extra strings. Don’t be stingy – buy a 10-pack. You’ll also need a bunch of picks. Throw a couple in your pocket, a few in your guitar case. Stick one under your pick guard. Maybe get one of those microphone attachments in which you can store picks. It’s the little things folks! Lastly on guitars, now that you’ve decided you’ll always have two guitars at every gig, you’re going to need two stands. They make very compact guitar stands today you can throw in a backpack. If you do end up forgetting a stand, I recommend keeping your second guitar close by, but in the case. Hopefully you won’t need it anyway but it will be safe from harm and ready to go if you do. I haven’t seen a lot of drummers break heads or cymbals during a gig, but if you are some heavy hitting monster, you might want to bring some extras. Make sure your kick drum pedal is solid and check the springs and all the moving parts. It’s not a bad idea to bring a backup foot pedal, but if you’re playing a multi-band gig, it’s likely one of the other drummers who will be willing to share theirs. Remember it might take a little getting used to though. Ask yourself, “how much do I trust my kit?” If it’s a higher end kit, it should be reliable with solid hardware and shells. If it’s old or a starter kit, check everything over. If something does fail on your drum set, you can often fake your way through a set. I had one side of my snare wires break off during a gig once and I just kept playing. No one, not even the band noticed. If you don’t have at least a couple of drum keys in your kit, you need to pop online right now and order some. Amazon can get you a pack of three for less than 10 bucks. Sticks, people! Have more than one pair of sticks. Don’t be that guy asking to borrow a set of sticks! “Borrowing” a pair of sticks is a major gig faux pas. It’s like asking someone if you can wreck something of theirs just a little bit. The simple act of playing drums wears heavily on a pair of sticks. Please don’t be that guy. As a vocalist, you have it easiest in terms of gear. Pack what you need to keep your voice, body and mind in good condition for singing: most importantly liquids to keep you hydrated. (Most venues have water, but you might be at an outside festival where you need to provide your own beverages and food). You may need a sun hat or a change of clothes. Think ahead and have a peek at the weather app on your phone before you pack for your set. Amps, guitars and drums all need tweaking once in a while and you never know when you’ll need to cut something, screw something or wrench something. Sometimes the difference between being able to play your instrument and not being able to play is a multi-tool. You can get an inexpensive multi-tool for less than ten dollars. They also make pretty cool multi-tools that are specific to guitars and drums so if you’re a gear head like me, you might want to do some research. A flashlight comes in handy in a low-light gigging situation. You may need to look inside your combo amp, find something that you dropped onstage, fix something small, etc. If you’re like me, you’ll need to restrain yourself or your gig bag will become unmanageable! I recommend you keep what you need in a separate bag you only use for gigs. It’s nice to grab that bag when you’re heading out to a gig rather than piecing it together from all over your house. A nice solid duffle or a roomy backpack should do the trick. If you’re going on a road tour, you might consider a hard case. It’s always good if your gear can arrive in one piece! Rock on. T. Perry Bowers is the founder of Taylor Sound.